We're taking off for the day, but feel free to keep asking questions. Brian will continue to check this thread over the next couple of days, and direct some questions to the appropriate experts. In the mean time, thank you all for coming out to ask your questions, and thank you for your interest. Thank you for your patience through the early technical difficulties as well. In Washington state, we’re three days away from the anniversary of the 1980 Mt. St. Helens eruption. And with everything happening in Hawaii, we figure volcanoes might be on your mind. We’re here primarily to answer your West Coast volcano questions, but will answer anything else we can. We’ve assembled a team of scientists and support staff ready to field your questions. We’re all using the same account and we’ll be signing off with our first names after the responses. Our speakers come from the Cascades Volcano Observatory (USGS) in Vancouver, Wash. and Washington Emergency Management Division at Camp Murray, Wash. When the Cascadia subduction zone moves again and we get the massive Pacific Northwest earthquake that those of us who live here are dreading, how likely is it that this event could also trigger eruptions in the Cascades? Larry here. The last Cascadia earthquake, around 1700 A.D., didn't trigger any significant eruptions. Globally, it's hard to find any good examples of large eruptions that rapidly followed big earthquakes. But there are examples people argue about. For example, Pinatubo's June 1991 eruption followed a M=7.8 earthquake in Luzon in July, 1990. But that was 11 months later. But could a very large quake be the "thing" that starts the whole process of "waking up"? Yes. Theoretically. But if there are any examples of this, they are sparse, and ambiguous. I thought earthquakes before eruptions are caused by the volcano beginning to "wake up"? Generally the seismic signals that show unrest (a.k.a. magma movement) are earthquakes, deformation, and changes in gas and heat flow/chemistry of the water. But these are usually specific types of earthquakes that show things like fluid moving through cracks, and rock breaking as fractures propagate and magma moves. There are often earthquake swarms (sets of many earthquakes over a short period of time - what constitutes "many" depends on the volcano) as a volcano is waking up that help indicate the magma movement. Usually, larger earthquakes happen along faults, but there are some faults located by volcanoes (i.e., the Mt. St. Helens Seismic Zone). Hi - Andy here - this is a popular question! The answer is that its not likely that a big subduction quake would trigger one of our volcanoes and cause an eruption. Think of Mt Fuji and the big Japanese subduction quake a few years back - nothing happened. You'd think that'd be a problem, but it doesnt happen often that a volcano shows any kind of eruptive activity concurrent with a big earthquake. You do sometimes see swarms of small earthquakes around what we infer are magma chambers, but it almost never results in an eruption. Which volcano in the United States is potentially the most likely to cause a large disaster ? Well, depends on the timeline. In the near future, Kilauea is the most likely to cause a large disaster. I suppose it also depends what what you mean by large. This feels like courtside seats to a reasonably strange supervillain origination story. Yo, Wes, I'm a computer scientist if you're looking for minions. Larry here. Hmm. I'm focussing on the words "most likely". Yellowstone is everyone's favorite end-of-the-world volcano. But it hasn't done much in a half million years. Kilauea does something every week. But most of the last 30 years it has has just been fun to watch. The choice isn't obvious. But I'd have to give the prize to Mount Rainier. A major lahar in one of the big drainages could definitely be a disaster. And the last one was about 500 years ago. This (like any volcanic eruption) is a complicated question. From an emergency management perspective, we are confident that most volcanoes in the cascades could lead to a situation that overwhelms local/state resources, and might become a declared Disaster. There are several main issues with this: volcanic eruptions, while usually heralded by unrest, have an uncertain timeline: They may have one large, catastrophic eruption, they may have unrest for months to years, experience multiple cataclysmic eruptions, go back to sleep after activity; or show any combination of those things. It's important to consider all of the secondary impacts of eruptions, too. Lahars might cover a river valley, destroying structures within it. The sediment deposited will alter floodplains, and change the flow of rivers for decades. The flow may damage or destroy bridges (The lahar from Mt. St. Helens 1980 eruption damaged many), which can impact supply chains for grocery stores, hospitals, and other critical infrastructure. Ash fall in an area can also impact air travel, regular vehicular travel, and many other aspects of life until it's cleaned up (which could take days to weeks). Even just closing the areas around a volcano in the pacific northwest, such as the National park, or the Mt. Baker Ski area has huge impacts on the local tourism economy, which is huge in the areas around volcanoes. Also, all being local tourism "rock stars" of sorts most Cascade volcanoes would attract tremendous international media attention if they were to even experience unrest, which would take a lot of coordination to handle properly (see Mt. St. Helens, 2004). ...By sheer size and area it might impact...and popularity, and history of hazard, but also thinking of all of those long term impacts, a large Lahar from Mt. Rainier would definitely be a catastrophic disaster that would significantly impact a huge number of people in the U.S.
That being said, the level of "disaster" of any eruption is best evaluated at a community-by-community basis! This is Mike. The larger the eruption, the less likely it is to actually happen, so this is a tough question. An easy answer would be a massive eruption of Yellowstone. That would have a heck of an impact, but is very very very very very unlikely to occur (maybe throw another "very" in there...just to be safe...). But there are more frequent processes that might also cause big issues -- a large lahar from Rainier, for example, might happen every few hundred years, and even if it is not associated with a large eruption (or any eruption), it could have a big impact. Take the Nevado del Ruiz, Colombia, lahar of 1985. That was associated with a minor eruption, but killed over 20,000 people. So the severity of the potential disaster does not necessarily scale with the size of the eruption. Regarding the current Kilauea eruption; any movement in the Hilina Slump? Do you see any current cause for concern for catastrophic landslide/tsunami action there? Admittedly, the 6.9 earthquake a couple weeks ago has left a few of us who watch too much TV... Shaken. This is Mike. Literally Shaken, I get it. I was in Hawaii (living in Volcano Village) stationed at HVO for the 2007 M6.7 in Kiholo. Can't imagine what it would have been like to have an M6.9 on the south side of the island. But, no, there is little to no danger of the Hilina slump collapsing, which has been the rumor that has been circulating. The Hilina slump is moving, but that's normal -- about 6-8 cm/yr towards the coast. And it lurched by 0.5 m as a result of the earthquake. But this is not surprising. It has experienced stronger earthquakes (1975 and 1968) and bigger intrusions (1840 and 1924) in the past. It is slumping as a block, and there has never been a collapse there in the past (no evidence for that on the sea floor). We posted some information about this on the "HVO News" section of the HVO homepage (https://volcanoes.usgs.gov/observatories/hvo/), right below the map. How vulnerable is Seattle to a lahar from Mount Rainier? What's the shortest possible notice we would get for a Rainier lahar? Like, say I happened to be standing in the middle of the Puyallup Fair, it's 1:00pm on a Saturday... is there any chance that we'd go from no detectable activity to "welp I'm dead" as I see and hear it coming minutes later? Carolyn here... Roughly 99% of Mount Rainier lahars originate from snow and ice melt during eruptions (perhaps 1% by landslides). Expect two levels of 'warning'--first from scientists seeing evidence of volcano reawakening and noting that volcanic activity increases the likelihood of a lahar. Secondly, the lahar detection-notification system gives Orting 40 minutes of warning. Expect that in the broad valley between Orting and Puyallup, the lahar will slow or stop entirely, yet still cause rapid and extensive flooding downstream. Hard to say how much additional time Puyallup has (depends on lahar size). So, at the fairgrounds, take another bite of that elephant ear, and get your wits about you. You will want to move up hill, preferably on foot rather than by car. Do it thoughtfully and safely. My dad lives in orting, he knows he's fucked. It's not a big deal at this point he's ready to die. Thats pretty cool to hear. Went to elementary near Orting and remember having Lahar drills back in the day. But aren't there deposits from past Rainier lahars in the Duwamish tideflats? Carolyn here... yes, those deposits in the tideflats are from sediment carried down the Duwamish after the lahars. Carolyn here... When a lahar strikes, everyone in the Seattle metro area will be impacted, either directly or indirectly. Portions of Seattle proper are at risk; others not. The port area and Duwamish valley are at risk not from lahars, but from lahar sediment filling the river channel, displacing water, and forcing flooding for weeks to decades or more after the actual lahar. The Emerald City up on its hills is not at direct risk from Mount Rainier lahars, but inhabitants will feel the pinch. Expect economic losses caused by interruptions in services, especially when the lahar disables portions of the regional transportation system and affects the regional supply chains. There is potential for interruptions to transportation, communication, power, and water supply. If Mount St. Helens is the mostly likely Cascades volcano to erupt next, which one would you bet on for number two? Hi, experts! Resident of the Big Island of Hawaii here, with a question about Kilauea volcano. The USGS fact sheets tell us that Kilauea has had long periods of explosive phases in the past -- which are much more violent than the effusive phase we have been in. How do we know if we're switching from an effusive phase to an explosive phase? Does the drop in Halema'uma'u Crater's magma levels signal a switch? Or will the lava lake come back, thereby continuing this effusive phase? This is Mike. The explosive phase is thought to coincide with a decrease in magma supply from the mantle to the volcano. This causes the magma chamber to empty and a caldera to form, and a lot of the explosive activity is goosed by water-magma interactions. We can estimate the magma supply by looking at deformation and lava effusion, and it's pretty normal for Kilauea right now. Even with the lava lake draining. So, no indication that we are transitioning to an explosive phase. Excellent question, by the way. How do you feel about U.S. East Coast Volcano Experts? I’ve never cared for them much myself. Is there any chance that Mt. Garibaldi or another volcano in British Columbia could erupt in the near future? On a related note, how closely do you guys work with authorities from other countries, especially regarding volcanoes that are in a position where their eruption could cause damage across national borders? Larry here. Mount Garibaldi's last eruptive activity was during the Pleistocene, forming Opal Cone on the SE flank and the Ring Creek lava flow. It is not a highly active volcano or a big ash producer like Mount St. Helens. Our colleagues at Natural Resource Canada could tell you more (http://www.nrcan.gc.ca/earth-sciences/science/geology/gsc/17100). I hope you see this one! So Bali, Vanuatu, Tonga, Japan, Hawaii all in the past 8 months. Is the ring of fire moving? Should we be nervous? Is my secret plan to steal a boat and sail to New Zealand not going to work? Edit... I forgot Java.. that was a big one too! You guys are definitely focused on more localized events im sure, but can you comment on the imminence of The Big One here on the west coast? Hello! I was wondering, is the Cascade Volcanic Arch inactive relative other volcanic archs like it? If so, why? And why is the great basin so inactive? There is evidence of (Geologically) recent volcanism (like in the case of Sunset Crater) but it seems rather sporadic compared to other rift zones. Larry here. On a global scale, the Cascade arc is sort of middle-of-the-range in magma production. In an arc, the rate of magma production is usually correlated with the rate of subduction. The rate of subduction of the Cascadia subduction zone is about 40 mm/yr, which is also roughly in the middle of the range on a global scale (9-80 mm/yr). What are your thoughts on the kileaua volcano incident? What are your thoughts on Yellowstone's activity recently and how we can avoid catastrophe? How does one join the team and become a volcanologist/geologist? This is Mike. Kilauea's eruption is an amazing opportunity to learn about how that volcano works -- it is a once in a lifetime event But it is coming at great cost to the people of the Island of Hawaii. We owe it to them to use the opportunity the volcano is providing to learn as much as possible about the event, so we are better prepared for future volcanic eruptions in Hawaii and elsewhere around the world. As for Yellowstone, there is no concern about that volcano. The geyser that has erupted 5 times in the past 2 months is not indicating anything new about volcanic activity there. An eruption at Yellowstone is extremely unlikely, and even if magma did reach the surface one day, the most likely form of activity would be a lava flow. There have been dozens of lava flows since the caldera formed 631,000 years ago. The most recent was 70,000 years ago. Check out https://volcanoes.usgs.gov/volcanoes/yellowstone/faqs_facts.html for some of the Yellowstone misconceptions dispelled! Finally, to become a volcanologist, it takes a degree in geology or related field (like environmental science). But there are many jobs in volcanology. For example, you could help repair equipment (electronics engineer), develop computer models (programmer), map compositions (field geologist), etc. Do what you love, and see if you can find an application to volcanoes! With Mt. Rainier, the emergency plans state that flows are most likely to follow the rivers, notably Puyallup and Nisqually. Tacoma and Lakewood fall right in between those. If Mt. Rainier erupted would this be an issue for those residing in those communities? And how likely would flows (lava, lhars, etc) go far enough down the river to be an issue? The nice thing about lava flows from cascades volcanoes, is that they are much more viscous than the lava flowing in Hawaii right now, so they are unlikely to flow very far. Still, they are a hazard within the Park, and on the slopes, and the heat of lava may melt slopes, so it's important to stay out of these areas if they are closed by authorities during an eruptive period. Lahars are more dense than water, being full of mud/ash/whatever debris they pick up along their path, but behaving like fluids, they do travel down river valleys - high ground is generally a safe bet, so it's important to know your evacuation routes if you live or frequently travel through areas that are in lahar zones. Lahars also deposit all of that sediment and debris when they stop, which can have long term effects on the rivers they flowed through: the rivers may be higher and flood in places that didn't flood before, and in severe cases, they may even clog rivers and shipping lanes: This sediment deposit can last for decades. Larry here. Lakewood wouldn't have much to worry about because no streams from Rainier go through Lakewood. In Tacoma, it depends on how close you live to the Puyallup River. Specifically, how high above the river you live. If you're more than a few tens of feet above the river, you're okay. But you might be cut off from places you want to go if your route goes down the river valley. Jon here. I've done quite a bit of volcano research and I've never heard of "lhars". What are those exactly? As for Rainier, if she erupted I would imagine those communities would be, quite literally, toast (depending on how nearby they). How nearby are they? The way you talk about it makes it sound like they're right there, and if so, the lava would hit it pretty fast. lahars, I missed an a. lol. In one of the other comments they said Orting has about 45 minute notice, so I would say we have a chance to do something. What I don't know, but something. Still not sure what lahars are. But yeah, I hope you never have to deal with this. Unfortunately 'canos be fickle mistresses. And there's really no way to know when one will blow (as far as I know, maybe one of these guys would know more about that). Sometimes I hear from people that Yellowstone is due for an eruption and going to erupt "soon." From the view of experts, is "soon" more relative to the age of the Earth or to the average lifespan of humans? This is Mike. Ha! You know, I think I'm going to win the lottery "soon". But that, and the Yellowstone case, are more relative to the age of the Earth (in fact, it's far more likely that I'll win the lottery than Yellowstone will erupt in our lifetimes...and I don't play the lottery, so that's saying a lot). Yellowstone is not "due" (see https://volcanoes.usgs.gov/volcanoes/yellowstone/yellowstone_sub_page_50.html for more on this). Volcanoes do not erupt on schedule. They erupt when there is a sufficient amount of magma beneath the surface to feed and eruption, and pressure to get that eruption to the surface. Neither condition exists right now. I often hear that Yellowstone erupts every 600,000 years (or whatever), and it is now overdue, but this is all nonsense. I sometimes think this is propagated by documentaries, where terrifying music plays under a narrator who inevitably states that whatever natural disaster they are covering is "overdue." That's a buzzword that makes me think "yeah, right." What's your take on the correlation between fracking and earthquakes? Larry here. This isn't a volcano question. But there is an established relationship between water injection at wells and induced seismicity. The correlation goes back at least to the 1960s, when water was injected at the Rocky Mountain Arsenal and in Rangely, Colorado. Hi all! Thanks for doing this AMA. 1 - How much warning would we likely have that an eruption is going to occur? 2 - If Rainier erupts, what areas are in the most danger? 3 - What do you see as the overall likelihood of Rainier erupting in the next several decades, and if you think it's likely, how dramatic will that event likely be/what magnitude of an eruption will it likely be? Thanks so much. I'm hoping to put her mind at ease with your answers, but I'm prepared to be proven wrong in my not worrying about these issues! Really appreciate your time - thanks again! What is the latest thinking regarding South Sister in central Oregon? I know there was some expansion going on in the 2000s, but my understanding is that the expansion has slowed down. Is there still significant concern about South Sister as a near-term hazard? This is Mike. There will always be concern about South Sister as a hazard. It's been about 2000 years since it erupted, and certainly there are many volcanoes in the Cascades that are much more active, but we must remain vigilant. The inflation is certainly a sign that magma is accumulating beneath the area. The rate of inflation has slowed substantially in recent years, but it is continuing at a low rate. Andy here - the intrusion that caused deformation at South Sister has not continued. Once the INSAR deformation signal was noticed CVO got right down there and instrumented it with seismometers, GPS stations and a regular geochemical sampling program. Its well-monitored now, but theres no indication of continuing activity. I think we're ready in case it reactivates, though. Do you have a favorite volcano? I think most volcanologists have a favorite volcano. Mine is Mount St. Helens. It's my neighbor. And it's fun to hike on (when it's not erupting). But Kilauea is warma and exotic. It might be my favorite winter volcano. A third would be Stromboli. It's always erupting. You can hike a few miles up the trail to watch it, then hike down to town and have nice Italian pizza for dinner. This is Mike. I'm from northern California, so I'm partial to Mount Shasta and especially Medicine Lake. Relatively few people know about that last one, but it's amazing. Beautiful, scenic, young obsidian flows, lava tubes... Check out https://volcanoes.usgs.gov/volcanoes/medicine_lake/ for more info on that one! This is Carolyn-- tough to make a choice! In the Cascades, I choose Mount Rainier for its beauty; Glacier Peak for its simple elegance and wildness. Andy here - If you're adventurous and self-sufficient you can't beat Guatemala. Santiaguito has been having dome-building eruptions like St Helens, pretty continuously since the 1920s. Fuego has spectacular, boot-shaking eruptions about every month. Pacaya has nice fire-fountaining and lava flows. Parts of the countryside are hazardous because of drug traffickers (boycott illegal drugs!) so it pays to be alert. Stromboli. Great food. Mediterranean climate. Constant eruptions! Yeah, if you're looking to go tropical, and you really insist on leaving the beautiful volcanoes Washington and Oregon have to offer, Ecuador is a spectacular place for volcano-tourism. Much like the Cascades, the Andes are just peppered with active volcanoes throughout: you'd be likely to see (and/or hear) eruptions from Tungurahua, and can check out all the culture that's built in the area around it. Similarly, Cotopaxi (one of the most picturesque volcanoes out there) eruptions have their own special part in history in the towns around it. Therea are tons of picturesque volcanoes like Chimborazo and Cayambe that might be difficult to tell apart from Mt. Rainier, and a few impressive Crater Lake lookalikes, like Quilotoa and Cuicocha. ...you can visit the equator while you're there, too! Who else had to google Lahar? I’m traveling to Maui in two weeks. Is there anything I should be worried about? What would you estimate the odds are that Kilauea will still be disruptive in two weeks? I am travelling to Volcanoes National Park then. I went there in early Summer, and there was a threat of a tropical storm! Also, sunburn. Volcanically, there isn't much to worry about there... Haleakala hasn't been active for a long time. Not unless one of the lava crevices is there right now. I'm not sure the specifics of which islands are currently hit. Is it definite that the disappearance of the lava from the lava lake at Kilauea is directly related to the fissure eruptions in Leilani Estates? Is it the same lava, and how is that known for sure, and that it isn't a different hot spot becoming active under the volcano? Lastly, how is 'a'a supposed to be pronounced? This is Mike. Yes, the disappearance of the lava lake and the Leilani fissures are definitely related. Kilauea's internal magmatic system is like the plumbing in a house -- it's all interconnected. We have also started to see a change in composition of what is erupting from the Leilani area, which indicates that magma from uprift is getting involved in the eruption. As for the pronunciation, it's AH-ah. Speaking of composition, have Hawaiian volcanoes ever erupted more evolved magmas than basalt, apart from Hualalai, which I know has erupted trachytes in the past? Also, is there any noticeable visual difference between a basalt lava flow and a basaltic andesite flow? This is Mike. There is a composition called "Hawaiite" which is sort of like obsidian, but tholeiitic (if I'm remembering my petrology correctly...mind you, this is coming from a geophysicist...). That's pretty common as a composition that comes out of volcanoes that are near the end of their lives. There's a bunch of that on Mauna Kea. Hawaiians used it to make stone tools. The Mauna Kea Hawaiite was especially useful because it was quenched by interaction with ice (it erupted when the volcano was covered by glaciers during ice ages past). Hi from UW! Here's my question: If Yellowstone blows, what are the chances that the resulting earthquake/crust movement will trigger any of the Cascade range volcanoes? Andy here - the chances of a big Yellowstone event triggering a Cascade range volcano are low. We dont usually see volcanoes responding to big earthquakes, at least not in the short term. This is Mike. Good question. There is not a lot of information on how volcanoes trigger one another. In general, there is little evidence to suggest that there are strong volcano-volcano interactions. Even earthquake-volcano interactions (at least in terms of earthquakes triggering eruptions) are pretty dubious, and there are only a couple of cases. So probably a Yellowstone eruption (and I'm talking about a big explosive eruption, not the more normal lava flow) would have little to no effect on the Cascades. I work in DuPont, but live in Olympia - a Rainier lahar is one of my biggest concerns with an eruption as there's a traffic chokepoint through the Nisqually valley. How much advance notice would we have of a lahar, and would it be safer to stay in DuPont or attempt to reach home? Larry here. Funny, I always see traffic choke points at the Nisqually when I take I-5! The Cascades Volcano Observatory is expanding its lahar warning network to include all the major Rainier drainages. I can't tell you exactly how much time you'd have, but my guess is more than an hour, assuming everything gets working as planned. Sorry, I’ve lived 99% of my life in Virginia and everyone else seems to have West Coast questions covered.. Is there anything an East Coaster should worry about volcano-wise? This is Mike. Not really. But every area has its hazards. On the west coast, we don't worry much about hurricanes, but that is an issue for the east coast. In contrast, you don't have to sweat volcanoes much, and the earthquakes are usually small (although can be more widely felt, like the Mineral, VA, event of a few years ago). Larry here. In Virginia, your biggest volcano problem will be an ash cloud. If you fly, you're at risk no matter where you live. I can't tell you how many people were stuck in Europe in 2010 because of an ash cloud from Iceland. Another one on Kilauea - in this image of Halema‘uma‘u why does the crater look so clean if it was full of lava only 2 weeks ago? This is Mike. I think that's actually an image of Puu Oo (the eruptive vent on the East Rift Zone, 20 km from the summit, that was active since 1983. 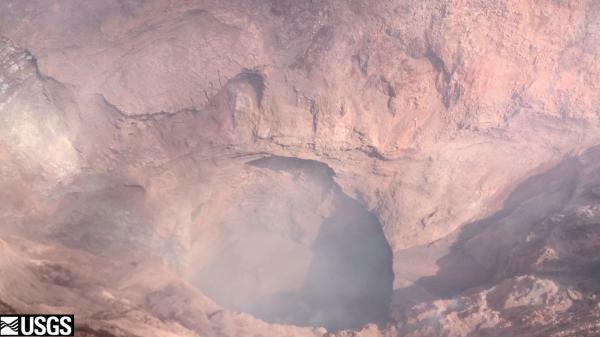 Of course, it was also full of lava 2 weeks ago... That lava drained and left what is in essence a rubble-filled hole. Sometimes, when lava drains, it leaves behind a veneer on the conduit walls, but that stuff usually falls off the walls pretty quickly. Hence the clean look -- no relict lava. Do the Azores Volcanoes act in similar fashion to the Hawaii ones? And why have they been mostly inactive despite being island volcanoes? Larry here. The Azores can produce just about everything. Big plinian eruptions like Fogo A can't be found in Hawaii. But they're in the Azores. I work with elementary aged kids in Special Education. Last week a 3rd grader drew a very detailed picture of a volcano and an asteroid crashing into it. I alleviated his fears of the likelihood of such an event, but he wanted to know what would happen if an asteroid did indeed crash into the crater of an active volcano. I had to tell him honestly, I don't know. What would happen? I've always been very interested in the Newberry volcano, because it's so different from the others in the Cascades. Did it form due to the subduction of the Juan de Fuca plate, or is it built from a different mechanism? This is Mike. Newberry is in the back arc, and has both basaltic and rhyolitic volcanism. It's thought to be a Cascade volcano, but influenced by extension of the crust behind the Cascade arc. It wouldn't be there if not for the subduction zone, but the composition/style is influenced by the back-arc extension. What can you tell us about Mauna Loa? I'm in Hilo and I know if it ever errupted, we'd be screwed. Also, what makes a volcano dormant and how long does it usually take a volcano to no longer be a threat? Mauna Loa is currently at an "Elevated" color code but that doesn't necessarily mean its going to erupt. For a couple of years now, there has been earthquakes and inflation above background, which led to the heightened color code. Inflation and earthquake activity has decreased over the past year plus. Mauna Loa last erupted in 1984. And it is known for effusion rates much higher than those of Kilauea. So, lava flows can travel down the flanks much faster during a high effusion rate. The Hawaiian Volcano Observatory is keeping a close eye on Mauna Loa and would know immediately if activity started. Is Mount St. Helens called the most dangerous volcano in the Pacific Northwest simply because of its historic eruption, or are there other factors in play (like location or geology) that quantifiably give the mountain this title? Hey so off topic question when it comes to real life but in that Jurassic World trailer it shows them out running an eruption and the ash cloud coming at them in real life how likely would it that they would actually survive such an eruption? I know the movie hasn't come out yet but it bugs me when I see the trailer. That part of the trailer really bothers me as well... I keep thinking, well, that was a pyroclastic flow, Chris Pratt is dead now... but because it's a movie, he will probably survive. As for survivability, there are some cold pyroclastic flows, but even those could be suffocating, because the gases they are made up of (in addition to all the ash and other particulates flying around within them) and move with extreme force. From the looks of the trailer, that scene should look like Jurassic Pompeii once all the ash clears. Hi there, I've lived in the Pacific Northwest my entire life and was always curious about the lesser known 'dormant' volcanoes here. What can be said about the activity or likelihood of the lesser known Glacier Peak becoming active? From what I've heard, Mt. St. Helens continues to be one of the riskier volcanoes in the area, but living near Rainier...that thing is just scary big. How big a risk does Rainier pose and what's the best estimate on when it'll next erupt? Mt. St. Helens gets a lot of credit for being very active, and highly explosive. Just check out any footage of the dramatic change between May 17th and 18th that happened in 1980. Also, St. Helens has been the volcano that erupts most frequently. Check it out, and feel free to post additional questions if you have any! Larry here. I think most volcanologists consider the risk from Rainier at least as great as from St. Helens. Mount Rainier doesn't produce explosive eruptions, but it can make big lahars that flow into populated river valleys, killing more people. And it's not clear whether there would be much warning before those lahars let go. Rainier gets a lot of attention as a volcano that could cause major damage in Washington. Are there any volcanoes in our state you feel are overlooked or under appreciated in regards to their potential hazard? Larry here. Glacier Peak gets overlooked. But physically (because it's hard to see from populated areas), and figuratively. It wasn't even on any maps of Washington until the late 1800s! But it has produced the 2nd-largest eruptions in the Cascades in post-Glacial time, next to the 7,800-year Mazama eruption that produced Crater Lake. It is also the second most explosive volcano in the Washington Cascades, behind Mount St. Helens. All these answers are too reassuring... Can you tell me something that might be worrying? In recent millennia, on average two eruptions per century in the Cascade Range. Hello! For those of us in Northern California, are there any dormant volcanoes near us? Any that you see possibly erupting in the next few centuries? If there are any dormant/extinct volcanoes here - are there any you would recommend hiking to try and learn about them - find old lava beds, etc? Edit: just wanted to say thank you for the fantastic answers! You've given me some great ideas for hikes this summer. I have had the opportunity to climb Arenal in Costa Rica (and go swimming in the lake that has formed in its crater) and it was an incredible experience. Looking forward to learning a bit more about the volcanos in my own neck of the woods. This is Mike. Yes, there are several N. CA volcanoes, all of which could erupt in the next few centuries -- particularly Lassen, Medicine Lake, and Shasta. Clear Lake volcanic field is less likely to erupt, but still warrants attention. To explore, I would go to Medicine Lake There are very diverse features there, from basaltic flows with lava tubes (Lava Beds National Monument!) to 900-year-old obsidian flows. It's a wonderland! More info about California volcanoes is at https://volcanoes.usgs.gov/observatories/calvo/. Larry here. Have you heard of the Clear Lake Volcanic Field? It's in Sonoma and Napa counties. When it's not erupting, there's good wine to drink and plenty of geothermal power. Last eruptions were about 10,000 years ago, producing maars and cinder cones near the lake. Might be a good spot for a volcanological field trip. WA local, just went snowshoeing on Mt. Rainier this past weekend for my class! How does the lahar detection system work, what sort of things do you guys look for? Do you guys do any research on ecological succession following eruptions, either on Mt. St. Helens in recent times or Mt. Rainier historically? Andy here - the lahar detection system uses ground vibration to detect lahars and tripwires to determine how big they would be. Data go to Pierce County 911 and Washington State Dept of emergency Management 24/7 centers. We're currently doing a massive upgrade of the system. The USGS Cascades Volcano Observatory doesnt do any ecological research of the type you mention. The Forest Service has been active in this at MSH since the eruption in 1980. How likely will the world end to a super volcano? This is Mike. Not at all likely. There have been two massive eruptions while humans have been on the planet -- Toba (Indonesia), at 74,000 years ago, and Taupo (New Zealand) at 26,500 years ago. Humanity was on the planet for both eruptions and clearly survived. Recent evidence suggests that early humans didn't even notice the eruptions! It would certainly not be easy, and humanity wold have a tough time of it, but the world would not end. Hi, thanks for the AMA. Question about Yellowstone but I suppose volcanoes in general. Is there a way to prevent them from erupting and even if there was would if cause more damage than good? Andy here - you can't keep volcanoes from erupting. The're too powerful. Sometimes people have tried to guide lava flows to keep them away from certain places but results have been uneven, and not very useful. Similarly, people have built dikes to guide lahars with mixed results. The problem with keeping these flow out of one area is that they might go somewhere else you dont want them to go, like your neighbor's house. We don't really have a way of preventing an eruption. A few months ago there was a concept paper released by NASA-JPL about drilling, but that was not realistic for a huge number of reasons. We put up an FAQ about Yellowstone drilling on the YVO website (https://volcanoes.usgs.gov/volcanoes/yellowstone/faqs_drilling.html). Occasionally we get people saying that we should "nuke" a volcano to keep it from erupting. Um...talk about more damage than good! This may work in the movies, but it's not something that would work in real life. Since there is no way to prevent an eruption, the best means of avoiding a disaster is to mitigate the hazards due to eruption -- build in the right place, monitor the volcanoes for signs of unrest, prepare for eruptions, and evacuate areas that are at risk when the volcano shows signs of imminent activity. Do you expect climate effects on other parts of North America if a major volcanic event occurs in the Cascades or in Alaska? Hello! It's always possible! Glacier peak, Mount Saint Helens, and Mt. Mazama (a.k.a. Crater Lake) have all had eruptions that produced widespread ash clouds in the past. It's likely that these had some impacts on temperatures in other parts of North America as well. Another significant potential climate impact form Volcanic eruptions is how much Sulfur Dioxide gas (SO2) they release, as this gas has a potential cooling effect on the planet. Mt. Pinatubo in the Philippines erupted in 1991, and in addition to all of the ash it erupted, there was a ton of SO2. Global temperatures were also approximately 1 degree (F) cooler than average that year, and it's attributed to the SO2 particulates injected into the stratosphere by that eruption. So... a particularly sulfur-rich eruption might have more impacts if it were strong enough to shoot those particulates up into the stratosphere. Larry here. In 1991, Pinatubo cooled the earth by about a degree Celsius for a couple of years. It was a VEI 6. 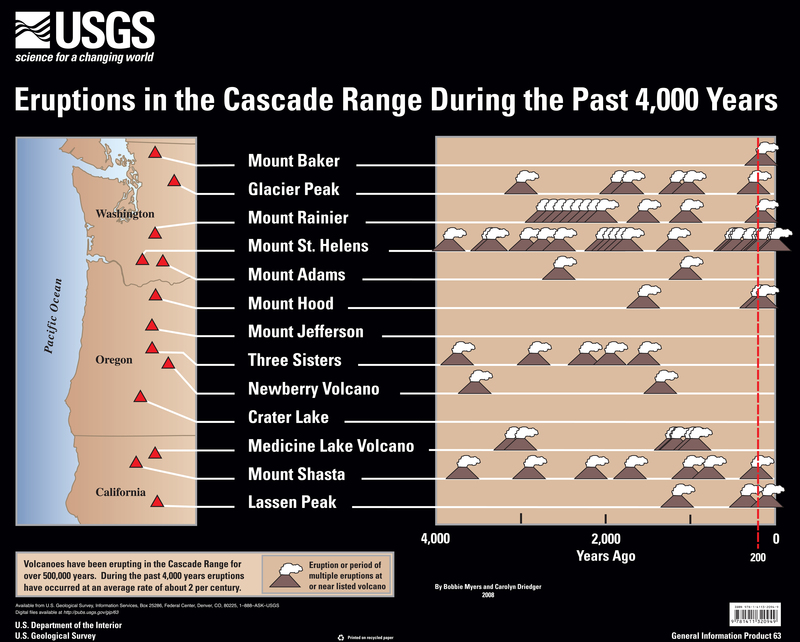 There have been only a couple of VEI 6 eruptions in the Cascades in the last 10,000 years. Mazama, and Mount St. Helens (Yn) might be the only ones. So I would not expect significant climatic effects from Cascade eruptions. What's your favorite seasonal TacoTimeNW menu item? I don't even know what's on their menu. Hi there!! As a new West Coast resident how can I educate, prepare (we had tornado back home... so we kept water. camping food, and gear always prepared) and stay aware of the earthquake/volcano situation within the Snohomish County, WA area? What would you consider to be the most important part of personal education surrounding the geology of the area? Hello! I would recommend talking to your Snohomish County emergency Management office, and possibly your City EM office if you have one. Those should be good places to learn about local hazards and preparedness specific to your region! For General WA State, I recommend our site, a www.mil.wa.gov/preparedness We also have specific earthquake and volcano pages that link to CVO and other organizations that specialize in these. Do you ever confuse the smoke that comes out of Snoop Dogg with the one of a volcano? One way to monitor volcanoes is to measure the gas content in volcanic plumes. Much like with volcanoes, we'd all be worried if Snoop Dogg began emitting more than a certain amount of tons of SO2 per day. If you couldn't work, or be a part of the team at the CVO, what other VO would you want to work at and why? Some day CalVO is going to have more than a field office in Mammoth. When that day comes, I'm headed to CalVO. Hey there! If I were you, I would suggest you pay a little more attention to Mt. Baker! It's not expected to have any immediate impacts to the city of Bellingham, but very large lahars could reach and impact the port. https://volcanoes.usgs.gov/volcanoes/baker/baker_hazard_82.html Baker's last period of activity was in 1975-76, when there was a lot of heat near the summit: it didn't lead to an eruption, but it's still an active Volcano. Mt. Rainier is extremely unlikely to have impact on Bellingham. It would have to have a significant ash eruption, and the wind would need to be blowing in an unusual direction. So any of you University of Utah grads? I ask because my mom is also a geologist and grad from there (and claims its the best geology program in the country). This is Mike. I'm not a UU grad, but I work with UU very closely on Yellowstone activity. Visited a few ties as well. It is an excellent program. No better place to study Yellowstone earthquakes!!!! Is there a rivalry between West Coast and East Coat Volcanoes? Carolyn ... Not really. West Coast has the East Coast beat. How likely is it that we will see a major eruption in Hawaii in the coming weeks? Will any ash from Hawaii reach the mainland? No. There is only a minor amount of ash coming form the summit. Even if there is a steam explosion, the ash will not travel very far at all. You can see that it barely goes beyond the south flank of the Big Island. Is this whole "we're over due for an eruption from the Yellowstone super volcano" thing true or it just official sounding people making noise? As a bit of a self-taught volcano expert, would you guys mind if I answered a few questions too just for practice? You could correct me if I get anything wrong. We don't enforce the rules. Just don't say your name is Larry. How likely is an eruption in Long Valley? Larry here. In the Mono-Inyo chain, there have been about 20 eruptions in the past 10,000 years. That's about as much activity as any volcanic area in the lower 48.
what signs are there before an eruption? is there any kind of "home seismometer" one could buy to warn themselves before an eruption? Is the Cascade Range inactive relative to other volcanic archs? If so why? Larry here. There have been different attempts to quantify the activity of the arc. Whether you consider, for example, cubic kilometers of magma per arc length per year, or something less qauntitative, like the average recurrence interval between eruptions of Cascade volcanoes, it's clear that volcanic activity is middle-of-the-range among volcanic arcs. Indonesia, Japan, and the southern Andes are much more active. Activity correlates with the rate of subduction. And the rate of subduction of the Cascadia slab, about 40 mm/yr, is in the middle of the range (0 to about 80 mm/yr). I video interviewed with a couple of CVO people when I was interviewing at CalVO last year. Just want to say y'all are awesome. For each of you, was there a specific volcano that first piqued your interest in the field? This is Mike. Mount St. Helens erupted when I as 4, and I remember it vividly, and also learning about it all through elementary school. I think that was what did it for me. Larry here. I cut my geologic teeth in Long Valley in the 1980s. It's a hard place to beat. Sunny skies. No devil's club. Big eruptions to study! Carolyn... Yes, I was totally into glaciers, but responding to the Mount St. Helens' eruption in 1980 stoked my interest in volcanoes. I have quite a few questions if you don't mind haha! Does CVO count the 1989-1991 phreatic activity at Mt St Helens as an eruptive period? What about Rainier 1894? Was its 1800 Plinian eruption from the summit or the north flank? I've read that the largest eruption in Mt St Helens' history produced a 15km3 bulk deposit, making it a VEI6 eruption, is that accurate? Is Mount Jefferson itself still capable of erupting? Are the "minor" eruptive centres such as Blue Lake Crater, Belknap, Cinnamon Butte considered as active, or if eruptions happened in the area in the future, would it be a case of a brand-new system being formed, like at Ukinrek Maars? Is the northernmost volcano in the Cascade Volcanic Arc Mount Meager or Silverthrone? Seeing as the RED/WATCH alert level has never been used so far, can you give an example of what would make you assign that one instead of RED/WARNING? I was thinking maybe the March 8, 2005 explosion at St Helens would qualify if the current alert system had been used then, as there was hardly any ashfall but the plume did go above 30,000ft. There is basaltic andesite and rhyodacite, but why nothing inbetween andesite and dacite? Larry here. Whoah! One at a time, randombeast! I'll take the first few. 1) No, we have not counted the 1989-1991 activity at St. helens as an eruptive period. To my dismay. They were the first eruptions I ever studied as a USGS volcanologist. They are also very cool because they seem to have been triggered by rainstorms. Most volcanologists don't even believe me when they hear it. But statistics don't lie (usually). 2) I'm not sure if we can say exactly where the vent was for the 1800 eruption. But as a plinian eruption, the summit would be the most likely source. 3) Yes, it has been written that the largest Mount St. Helens eruption, the Yn eruption, produced a deposit whose volume was about 15 cubic kilometers. But a recent paper revised that number downward by about a factor of two. I suspect the revision won't be the last word though. Stay tuned. 4) It's a good question whether Mount Jefferson is still capable of erupting. The last one from the summit was some time in the Pleistocene. But there has been Holocene activity at monogenetic vents on the flanks. If I had to, I'd bet the next eruption in the area would be a cinder cone or lava flow nearby, not at the summit.